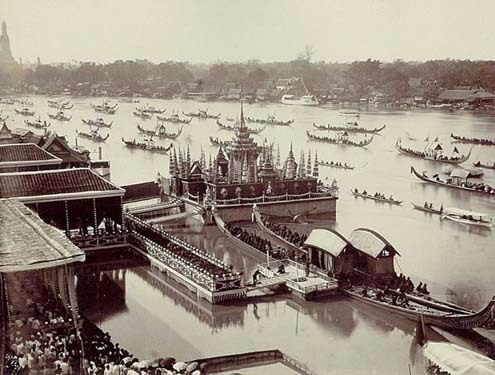 On special occasions His Majesty the King, or his representative, travels along the river in the royal barge to present new robes to the monks at the Wat Arun or Temple of the Dawn. All the barges in the Precession are works of art decorated in traditional Thai fashion, but it is the Royal Barge itself which is the highlight of the event. Occurring at dusk the barges are well illuminated to make this an outstanding display of Thai craftsmanship and royal patronage. Decorated with colored glass the Royal Barge is symbolically in the shape of a swan and is rowed by robed attendants. Fifty two barges are in the precession of which 51 are historic while the most recent was built in 1994 by the orders of His Majesty King Bhumibol Adulyadej. Starting at the dock in Khet Dusit from the Wasukri Royal Landing Place the precession is powered by over 2000 individual oarsmen. 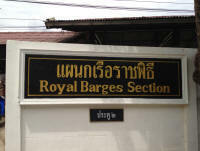 During the years when there is no Royal Barge Precession it is still possible to see some of the barges at the National Museum of Royal Barge. All the major four Royal Barges are on display as well as some of the minor barges. The museum is on Bangkok Noi canal near Phra Pin-klao Bridge, and is open 9 to 5 every day of the week. The river stretches from the north all the way into the Gulf of Thailand, with the Chulachomklao Fort being placed near the end where it joins with the sea. Starting quietly in the hinterlands the river is formed from the confluence of two smaller rivers, the Ping and the Nan. Together at Nakhon Sawan (also called Pak Nam Pho) they come together quietly in a rual setting some 200km north of Bangkok. Due to the winding course of the river it takes almost 350km for it to reach the city and the sea. Many tributaries and canals intersect the alluvial plain that is created by the Chao Phraya river, and the Tha Chin river which starts from it and runs parallel into the sea.